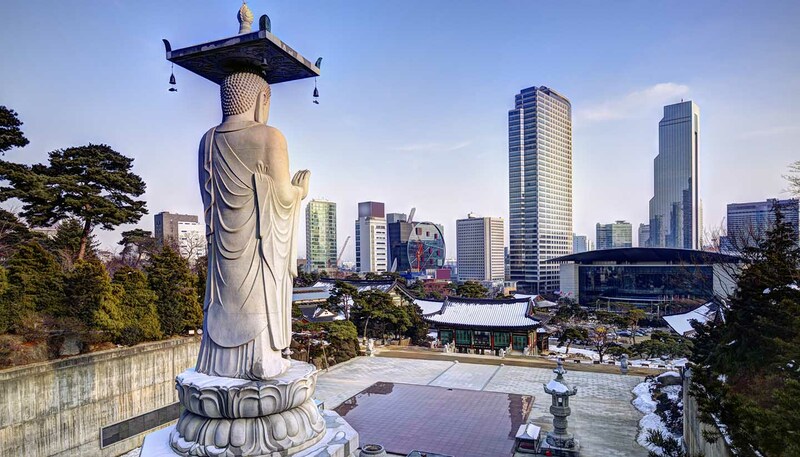 Asiana Airlines (www.flyasiana.com) and Korean Air (www.koreanair.com) operate flights to South Korea from across the globe, including direct services from the UK and the USA. Major airports are: Seoul Incheon International Airport and Busan Gimhae International Airport. Busan Gimhae International Airport is situated 22km (13 miles) west of Busan. Seoul Incheon International Airport is located 48km (30 miles) west of Seoul. The airport, located on the island of Jeju, is 4km (2.5 miles) from the town centre. From London - 11 hours; New York - 14 hours 30 minutes. Although there have been test runs in the past, there are no passenger services at present between North and South Korea. North Korea can only accessed by train from China, with services between Beijing and Pyongyang; South Korea is not accessible overland as travel between North and South Korea is forbidden. For details of China-North Korea tours, try Koryo Tours, run by Westerners based in China (www.koryogroup.com). There are currently no routes by land to South Korea, as travel by bus or car through North Korea is prohibited. Main ports: Busan (in the far south), Incheon (due west of Seoul) and Donghae (in the far north). Sailings to Fukuoka (Hakata) in Japan from Busan are run by Japan Kyushu Railway (www.jrbeetle.co.jp), with 4-5 departures a day, and the Camellia Line (www.koreaferry.co.kr) with one departure a day. Thr Kampu Ferry Service (www.kampuferry.co.jp) has daily departures to Shimonoseki. There are many options to sail to China from Incheon, including Jinchon Ferry (www.jinchon.co.kr) between Tianjin and Incheon, and Weidong Ferry (www.weidong.com) from Incheon to Qingdao and Weihai. Ferries to Vladivostok in Russia depart once a week with DBS Ferry (tel: +82 2 548 5502, www.dbsferry.com).